Sometimes, you might want to reveal AR content in a layer based on different user group. For instance, only a logged in user can see certain type of content. In this tutorial, we will demonstrate how to implement user authentication mechanism in a layer. Before we get started, you are strongly recommended to read here to understand the general flow of user authentication. In this tutorial, AR content will be shown only when a user is logged in successfully. On the publishing site, configure the "Additional settings" page to enable user authentication mechanism. Database modification: create a User table in the database. Create login form where a session cookie is set up once the user is logged in successfully. Modify the POI web service to return POIs when user is logged in successfully (session cookie is set and valid). Please NOTE that this tutorial (including the sample code) is ONLY to demonstrate how user authentication mechanism works in Layar. Developers should add more security checks and validation rules on user input data. For instance, always use HTTPS rather than the standard HTTP. The detailed explanation on each field can be found on Howto - User Authentication page. We will create a User table to store user account information, namely username and password. The following sql query is used to create the User table and the "username" should be unique. We also add a "salt" with a length of 15 chars. It is used to lengthen the password and also creates random hash code for each password. The objective is to better encrypt user password. We also create two pages adduser.php and adduser_submit.php for users to create an account in User table. These files have been provided in the sample code at the end of the tutorial. 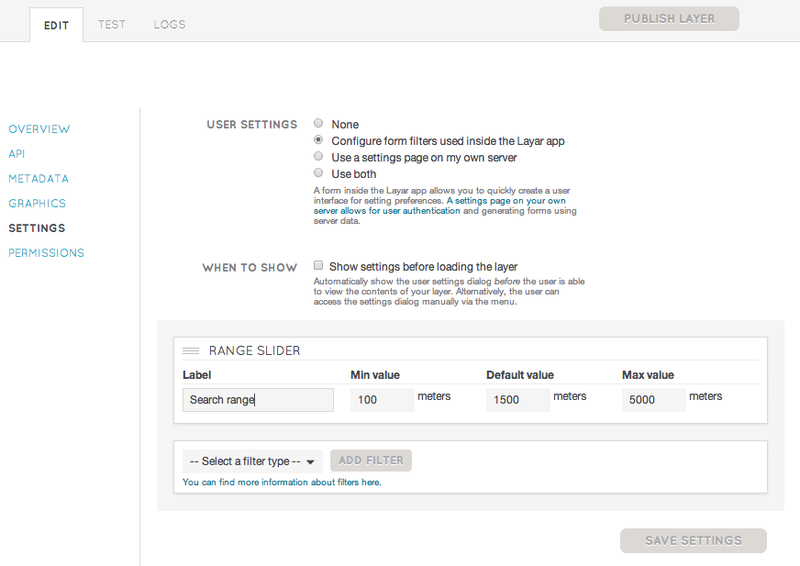 On the publishing site, we have provided a link in "URL for layer settings page". In this loginForm.php script, we will check whether a user is already logged in. If we can not detect a valid session cookie, a login form is shown so that user can fill in their user name and password to login. Otherwise, a loggedin.php page is shown where user can choose to logout or go to the AR view directly without logging in again. Now lets have a look at loginForm.php. // Include the custom functions. // Make sure that code below does not get executed when we redirect. // makes sure they filled in both username and password. // regenerate a new session id to prevent session fixation. // whether a user is logged in or not. // redirect the user to the Camera view once the cookie is set. // NOTE: please use the right layer name. // If there is any error message, show it here. As you can see in the script above, we firstly use function isLoggedIn() to check whether $_SESSION['valid'] is set and valid. This function is defined in functions.php. If a user is already logged in, the user is directed to a page called loggedin.php. If a user is not logged in, a login form is shown. After filling in the correct username and password, $_SESSION['valid'] is set and the user is directed to the Camera view using a layar intent (header("Location:layar://layername/?action=refresh");). Please make sure that you specify this link when you try out the sample code. In POI provider service, if a user is already logged in ($_SESSION['valid'] is set and valid), we will search through the POI table to return POIs within the search range. If user is not logged in, an errorCode 30 will be returned in the getPOIs response. The Layar client will open the page defined for "URL for layer settings page" (in our case, loginForm.php) when errorCode 30 is returned. ... // defined custom functions. /* Connect to MySQL server. We use PDO which is a PHP extension to formalise database connection. For more information regarding PDO, please see http://php.net/manual/en/book.pdo.php. Please NOTE that we did not list all the custom functions here due to the size of the tutorial. They are defined in functions.php. addUser.php - A form where user can fill in their new account details. addUser_submit.php - Validates user input and inserts user account into User table. loginForm.php - Logs user in and sets session cookie when a user is logged in successfully. userAuth_simplified.php - POI provider service which returns POIs within the search range when a user is logged in. functions.php - custom functions used by other scripts. You can download the attached Sample Code to play with it. Please make sure that you read the readmefirst.txt first.